The first weddings on top of the Sinamale Bridge will be held on August 31, says Ministry of Housing and Infrastructure. Ministry of Housing and Infrastructure issued an information sheet for interested parties to design backdrops and decorations for the weddings, which says the first of the weddings will be held at 4 pm on August 31. Weddings on top of the Sinamale Bridge are available in four themes; Maldivian, sunset, floral and vintage. The previously announced ‘Chinese theme’ was not included in the information sheet issued this Wednesday. Ministry of Housing and Infrastructure has asked interested parties to send in their proposals by 1:30 pm on August 1. The ministry announced in a previous press conference that those who apply for the wedding on top of the bridge must be applying for their first marriage, and that only 50 guests will be allowed. The cost of catering, photography and decoration will be undertaken by the Maldivian government. 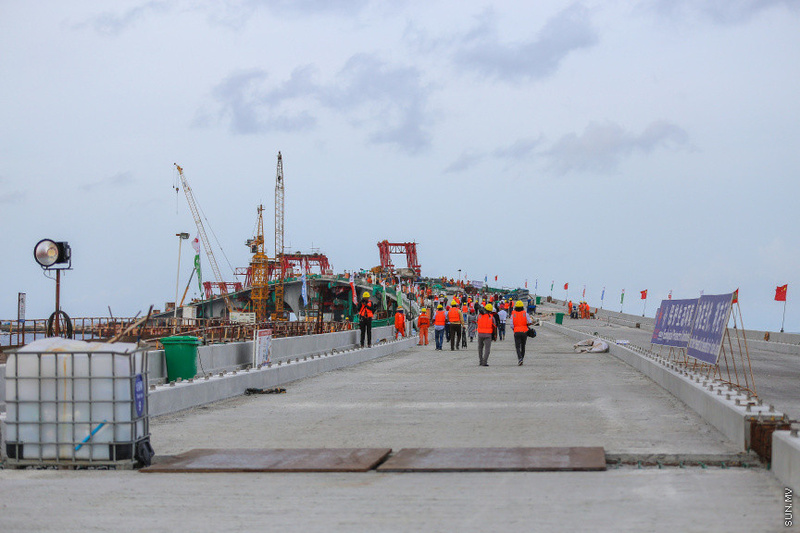 The structure of the USD 200 million Sinamale Bridge has now been completed, and light fixtures are being installed. The ministry has announced the bridge will be opened later this August.